All of us were drawn to Michael in the first place and absorbed something from him. His pots still stop me when I turn the pages of a magazine, but twenty years ago, when I began potting, his were the only contemporary pots that had that power. Now there are others, in large part thanks to him. 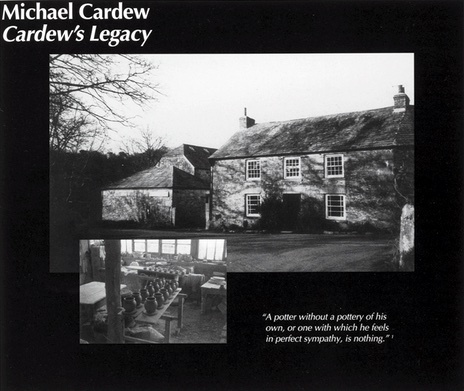 Michael Cardew said to me, in the year preceding his death in 1983, that he hoped "it"— meaning Wenford Bridge Pottery and all it represented— would survive him and continue at Wenford and in other places. Some of us were lucky enough to have our life spans overlap with his and to have the chance to live and work with him. What Michael gave was of incomparable value. I would like to share it with young potters today who never knew him. Here are some words from eight potters who found something of value at Wenford and who continue to work in ways that are at least partly a tribute to Michael Cardew.